Some of my relatives who eat low-carb diets introduced me to the veggie tots produced by the name brand Green Giant. They look like tator tots but have a veggie filling instead of potatoes, which means they have fewer carbs and are healthier. 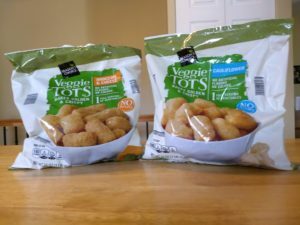 Aldi recently introduced its own line of veggie tots. Season’s Choice Veggie Tots offer one full serving of veggies and contain no potatoes. They come in two varieties: Cauliflower or Broccoli & Cheddar. They sold for $2.99 for a 16-oz. package at the time of publication. 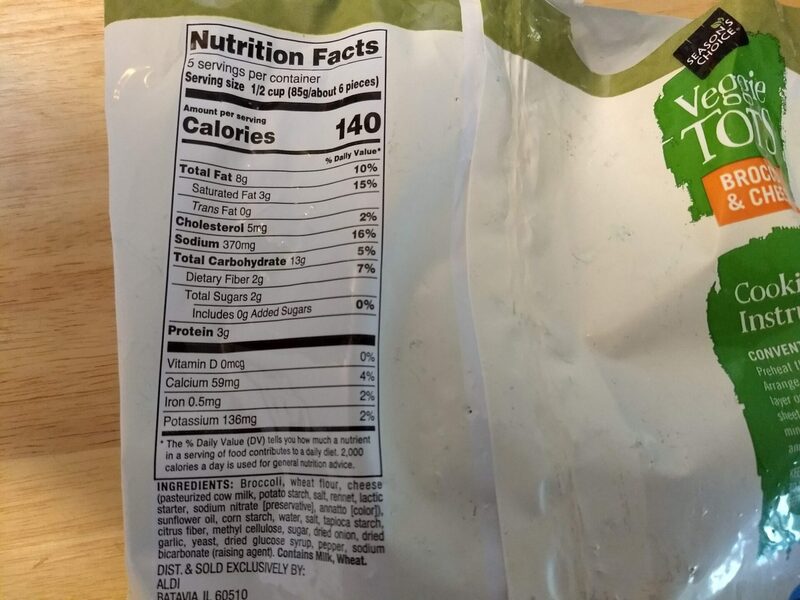 In comparison, Green Giant’s Veggie Tots sold for $3.48 for a 14-oz. package at Walmart at the time of publication. Keep in mind that these are a limited-time ALDI Find, which means that stores have a small supply and once they’re gone, they’re gone. So if you want to try Aldi’s Veggie Tots, don’t delay. You’ll find them in the ALDI Find (Special Buy) freezer section at Aldi. Also of note: the plastic bags in which these veggie tots are packaged have a symbol indicating they are recyclable if taken to a store that has a drop-off bin for recycling plastic bags. Don’t throw these bags in your regular curbside recycling bin! They are prepared by baking in the oven. To bake them, preheat the oven to 425 degrees. Arrange the veggie tots in a single layer on a large baking sheet. Bake 12-14 minutes or until golden and crisp. Keep frozen until ready to cook. I like both varieties of Aldi’s veggie tots. After baking in the oven about 14 minutes, they had a crisp outer shell with a minced veggie filling, and they are a nice side item for lunch or dinner. I have had name-brand Green Giant cauliflower veggie tots, and the Aldi version is, to me, indistinguishable from the name brand. I have not had name-brand Green Giant broccoli and cheese veggie tots, so I can’t speak to how the Aldi version compares, but the Aldi broccoli and cheese tots do taste good. My family enjoys eating the veggie tots with a little Ranch dressing for dipping, but some people may prefer ketchup, or no dip at all. The Cauliflower Veggie Tots, perhaps not surprisingly, have fewer calories than the Broccoli & Cheddar Veggie Tots. One 6-piece serving equals 100 calories, 2 grams of saturated fat, 0 mg cholesterol, 310 mg sodium, and 12 grams of total carbs. They also have 1 gram of protein. 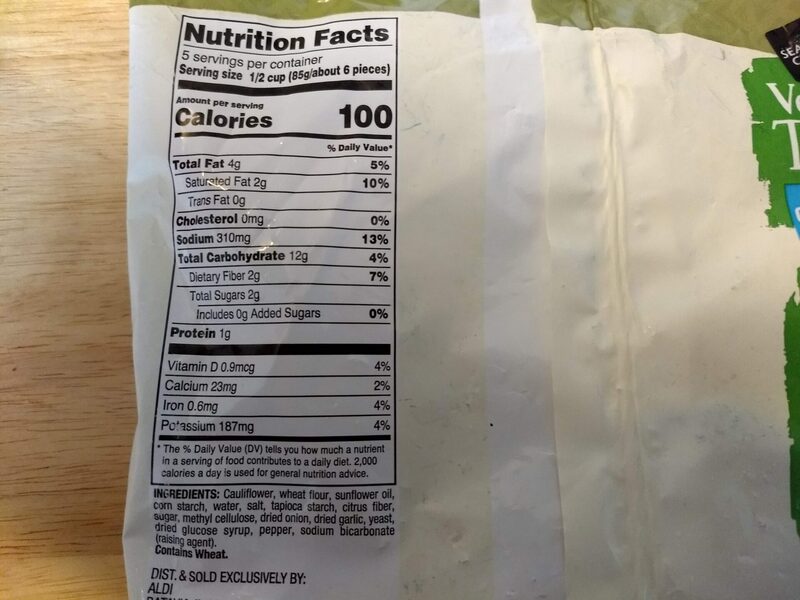 Ingredients are: cauliflower, wheat flower, sunflower oil, corn starch, water, salt, tapioca starch, citrus fiber, sugar, methyl cellulose, dried onion, dried garlic, yeast, dried glucose syrup, pepper, and sodium bicarbonate (raising agent). For those concerned about allergies, these contain wheat. The Broccoli & Cheddar Veggie Tots net 140 calories for one 6-piece serving. They contain 8 grams total fat, 5 mg cholesterol, 370 mg sodium, and 13 grams of total carbs. They also have 3 grams of protein. 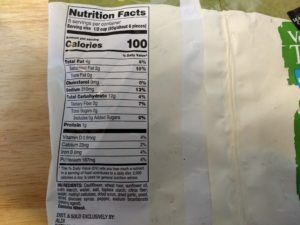 Ingredients are: broccoli, wheat flour, cheese (pasteurized cow milk, potato starch, salt, rennet, lactic starter, sodium nitrate [preservative], annatto [color]), sunflower oil, corn starch, water, salt, tapioca starch, citrus fiber, methyl cellulose, sugar, dried onion, dried garlic, yeast, dried glucose syrup, pepper, and sodium bicarbonate (raising agent). For those concerned about allergies, these contain milk and wheat. The limited-time ALDI Find Season’s Choice Veggie Tots are comparable to name-brand Green Giant veggie tots. They come in cauliflower or broccoli and cheese varieties and bake up crisp in the oven with a hot veggie filling, with fewer carbs than traditional tator tots. They’re not the same as fresh, unprocessed veggies, but if you’re trying to get more vegetables in your diet, give these a try. Hi Rachael, I just happen to stumble on your site complaining about Aldi’s Ultra Strong toilet paper disappointment. I ventured to see what else you wrote about and to my surprise I found this. I’ve been buying the Walmart Green Giant brand of broccoli and cheddar and just recently the Califower tots and I loved it. I didn’t know that Aldi’s carries it, I’ll have to check it out. Thanks for the tip and you awesome work. Keep it up!